Post-Speedweeks bonus – Welcome to Late Model Digest! 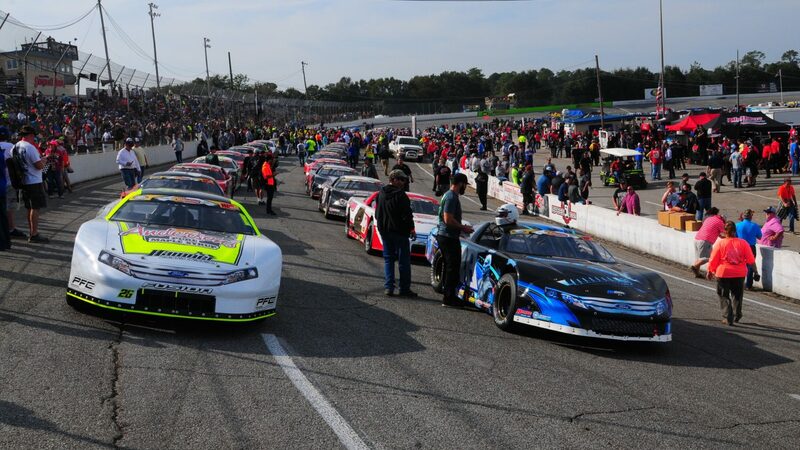 The latest issue of Late Model Digest, featuring the coverage from the World Series of Asphalt Stock Car Racing at New Smyrna Speedway, has been released. It will be made free for everyone; just contact us through this website or the LMD Facebook page and we’ll zip it to you. All subscriptions will be extended by two weeks. It’s possible that the scenes at Speedweeks can’t be properly shown in just 32 pages. Here are some extra looks at the New Smyrna festivities; click on the photos for descriptions and credits. Enjoy the upcoming season, everyone! Super Late Model driver Jared Irvan (right) had crew help on the final night from former NASCAR K&N Pro East Series and USAR Pro Cup driver Reid Wilson (left). Pro Late Model rookie Austin MacDonald (left) prepares for a race with King Racing crew chief Andrew Hicken. Pro Late Model champion Sammy Smith enjoys his final trip to victory lane with his father Kurt. Former Late Model driver and current modified racer Ricky Moxley finishes an order from Brooke Jones, the wife of longtime track photographer and Speedweeks fixture Jim Jones. Former Pro Late Model champion and new chassis builder Dakota Stroup (left) mentored rookie Sam Johnson. Wisconsin teenager Gabe Sommers (right), the Super Late Model points runner-up, debriefs after qualifying with his adviser for the week, Travis Sauter. Travis Kvapil (left), the father of Super Late Model teenage star Carson Kvapil, chats with Dean Strom, who had some announcing duties over the weekend at nearby Daytona International Speedway. Strom was the PR director of the old NASCAR Midwest (RE/Max Challenge) Series when Travis was a regular competitor in 1998-2000. Travis Braden watches his car owner Bill Burba make an adjustment on his Super Late Model. Burba also drove in the modified class.